Boy I'm really glad I found this site. I have pain in my left hand between the 2nd & 3rd knuckles (middle finger & ring finger) and I knew something must be wrong today when I was doing the same weight lifting routine with right and left hands, but only my left hand hurt. I think it could be only affecting my left hand because that's my fretting hand on guitar, and my chord hand on piano, so sometimes it has to stretch quite a lot. 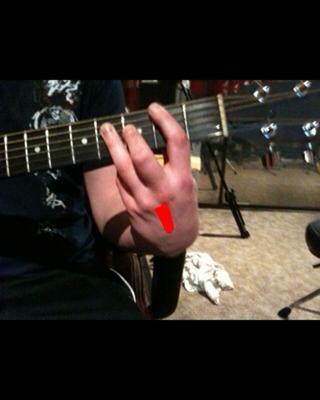 My left hand gets in some pretty uncomfortable positions while playing guitar or piano. Sometimes it has to stay in that position and push down. The pain is in a very specific place (see attached photo). It's the same pain when I play guitar as when I was weight lifting today. The pain occurs from the act of squeezing, or gripping a bar. It hurts when I connect the tips of my thumb and 4th finger (ring finger), and when I rub in between the knuckles and below. It's not a shooting pain, but more of a dull, achy-soreness. What is it? Is it tendonitis? could be the beginning of Tendonitis. I mean, look at that awkward position the hand/wrist is in for hours while playing. Easy to get strain there. And sometimes, the body just gets aches and pains. Still, might as well start keeping your hands/arms in as good a shape as possible if you want to play forever. Start with some ice dipping as described on the How To Reduce Inflammation page and see what happens, then update me. Try this for pain between knuckles from playing guitar? Playing with such an arched wrist and extended fingers does put strain on that area specifically and prolonged practice and training in this position will bring about the symptoms you are experiencing. If you are self taught you might have picked up a bad habit, like positioning or tensing up, which a qualified teacher would be able to help advise you on correcting. I have pain exactly at the same spot this guitar guy is having. I play tennis, not regularly, 3 times a week for like 1 hour a day. lately i have developed this pain between knuckles and it hasnt gone out even after resting. I went to the doctor 3 weeks back and he said i have been diagoned with tendonitis and he prescribed me anti inflammatory medicines for a week and recommended to me a hot wax bath for 10 days. Heat brings blood to the area. Ice flushes old lfuid and waste product and irritant from the area, then the body pushes new blood to the area. Thus I'm a fan of effective icing. I've got the same thing currently. Started with small pain, gradually increased. Characterized by build up of pain, goes away If I stop for minute, and seems to go away after long playing session. Saw physio first. He said strain, need stretching, this failed. Saw doctor, said to take anti inflamm tabs. Helped a bit but went to see west end hand specialist. I have tendonitis in this tendon caused by over use, lack of rest, friction against the bone. Had steroid injection, and am resting for 6 weeks, will change my warm up technique which focused on the injured area - silly, and adjust playing style to minimise overuse of this tendon or finger. IE where I can use finger 2, or alternative position I will. Will never play through pain again, ice more and rest more.